Eleven titles later, it’s still a nice feeling to be *reminded*, to have *concrete evidence*, that I *am* an author. 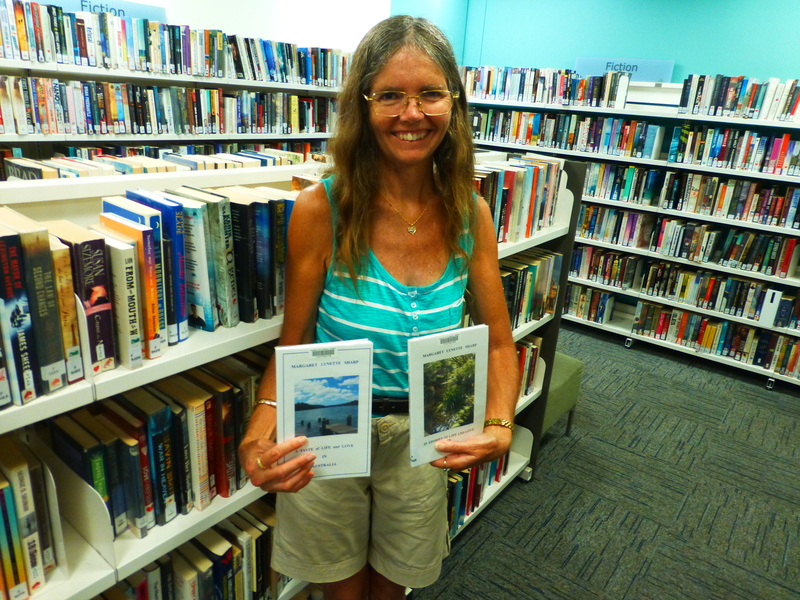 So, how proud I was when I visited Kogarah Library some months ago, to find my books on their shelves. Today started delightfully. Not only was the sunshine streaming in through the windows, I also discovered a beautifully-crafted review of my first title, ’25 Stories of Life and Love in Australia’ had been posted. Particularly interesting to me was its perception of this book through the eyes of someone living outside of Australia. A big thank you, Jake! Some years ago, the wife of a dear friend of mine told me to grab a few sweets available to all the guests at the end of a lovely dinner. Having chosen the wrong ones, she corrected me by saying, “Not those ones, the other ones, the small dark-chocolate ones.” I picked up a few of these and they proved to be absolutely delicious morsels. That’s what these twenty-five stories reminded me of. Small bits of wonderment that do not quite tell you the end; they rather let you imagine it and savor it in your own mind. “25 Stories of Life and Love in Australia” also provide the reader, especially the ones that are not Aussies, with some unique expressions and references common to that lovely land, for example, “cuppa” for a cup of tea, and kookaburra, which is a kind of bird. You will get all the flavor of the land down under, Ms Sharp makes sure of that. Do you look back on milestones: consider your life before and after THE EVENT? I guess all of us, if we survive into middle age, can look back and pinpoint the decisions that have moulded our lives. It could be anything: from personal involvements, trips, or choice of career. One of my most recent big moments came almost two years ago. I decided to write a book. I think this idea came into being around the time of the wedding of a close relation. Of course, I saw this a milestone in her life: a decision, a turning point, for the future. She would have this to look back on. I suppose I then considered that I, too, wanted a milestone. Already happily married, it had to be something else. A career! And realistically, the only career that held prospects of satisfaction for myself was as a writer. I had the background: successful completion of literary courses, followed by extensive reading and life observation. So, egged on by my husband, and later editor, Ronald Sharp B.E.M., I started to write a book. A book of Short Stories, set in the Australia that I love. A book that spoke to others of the joys and vicissitudes of life and humanity: that could make you laugh, or maybe shed a tear or two of happiness. That book, a collection of Short Stories, became known as ’25 Stories of Life and Love in Australia’. It gave me my first taste of the pleasure of receiving a five star review; a pleasure which was not repeated for many months, since getting the work into the wider literary community is, unfortunately, a slow and difficult process. At last, I’m making progress. Six books published, and it’s just starting to happen! Exciting times! At last, we’ve caught up with technology and published with Kindle! My first book, 25 Stories of Life and Love in Australia’: http://www.amazon.com/dp/B008FP217C: is now available. There’s a diverse range of stories and vignettes, such as ‘Family Values’ ( a tale about a family visiting their folks in the country); ‘New Digs’ (about an elderly lady changing her address); ‘Fresh Pickings’ ( a tale of young love and expectations); ‘The Virgin Dancer’ ( discovering dancing in middle age) and ‘A Question of Trust’ ( a new relationship in trouble). Many readers have told me that they liked it very much, and some have purchased extra copies as gifts. If you like Short Stories, particularly those written by Australian women writers, then I suggest you investigate this volume.